The Open Door Music Project is collaborative initiative between the UNI School of Music, Cedar Falls and Waterloo Community Schools. The purpose of the project is to create opportunities for future music educators to experiment with non-traditional music making in order to make music more inclusive, equitable and diverse. Music teacher preparation programs provide many opportunities to participate in traditional band and orchestra. Future music teachers are least familiar with (creating and performing) the music genres their future students are will be most familiar with. 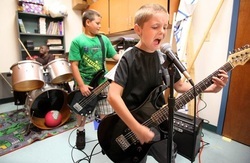 Popular and electronic music classrooms in the schools can provide music experiences for the large percentage of students who don’t currently participate in music in or outside of school. Through a partnership with two local school districts, representives from the UNI School of Music visit schools to create music making experiences that range from guitar classes to electronic music ensembles.